Barcelona defender Gerard Pique wasn’t happy with Philippe Coutinho’s application in training this week, and he let him know about it. The Brazilian playmaker continues to struggle to showcase his best at the Nou Camp this season, contributing just eight goals and five assists in 38 appearances. In his last 13 appearances in La Liga, he’s managed just one assist, leading to him starting on the bench in two of the last four outings. 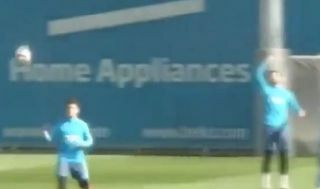 With the pressure building on him to deliver on the pitch, it appears as though Pique wasn’t too happy with him in training on Friday either, as seen in the video below. The defensive stalwart is said to have criticised Coutinho for ‘not being plugged in’ as he looked off the pace in trying to retrieve the ball from a stray pass during a training drill. It remains to be seen if Coutinho starts against Rayo Vallecano on Saturday evening, but he’s seemingly got a lot to do now to turn things in his favour and ensure that this season is considered a successful one on an individual level too. Pique shouting at Coutinho who lost his focus: "Coutinho you're not with us"
Coutinho isn't enjoying the best of times at Barcelona currently and Pique called for more focus from the Brazilian during Friday's training session.